The warm weather and sunshine is (hopefully) here to stay in New England and we're getting our freezer ready for grilling season. I have this weird aversion to pre-made store bought burger patties that I believe started when I was a child. My mother always bought ground beef and stocked our freezer with home made burgers and believe me, you can taste the difference. Burgers made from lean ground beef are a great source of protein and iron but if you're trying to cut back on fat, burgers made from skinless ground turkey breast offers a great low-fat option. Turkey tends to be a little bland when left alone. 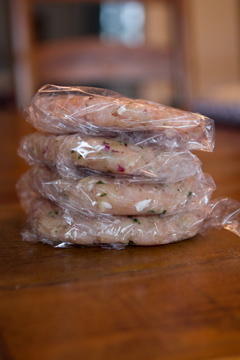 That's why we like to jam pack our turkey burgers with lots of fresh flavors like red onion and parsley from the garden! Mix up a big batch and grill some up this week! You won't be disappointed! Prep Ahead Plan: I usually mix up 2 pounds of ground turkey and make 12 burgers. If you want a bigger quarter pound burger than use 2 pounds to make 8! Wrap them individually in plastic wrap and store them in a ziploc bag in the freezer! We put ours on the grill straight out of the freezer. *We like to use a sprinkling of Lawry's seasoning salt in place of regular salt for a little extra flavor! 1. In a bowl, mix all ingredients together with a fork. Make sure they are thoroughly combined! 2. 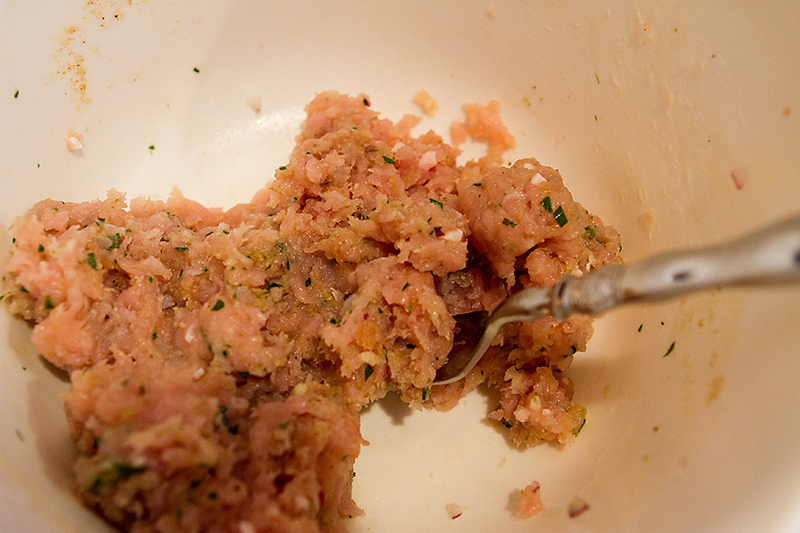 Divide mix into the desired amount of patties. I make 12 out of 2 pounds but if you prefer larger burgers, you could make 8 patties. Shape into rounded balls and press into patties, wrap in saran wrap and freeze or grill them up! Copyright © PrepAhead and Dine In: The BEST Turkey Burgers Ever.... All Rights Reserved.